We’ve had our fair share of early starts during this holiday, but we’re trending more and more towards late ones now. I wasn’t complaining this morning about the slow start. I ‘was’ complaining, however, about being stuffy and having a sore throat. Sadly, I’m in the throes of a full-blown common cold. With it now being time to pack, I picked the wrong time to fall ill. Truthfully, there’s never really a good time to fall ill. It always gets in the way of something that’s critically important, meaning you just have to soldier on. I could have done with staying in bed the whole day today but that was never going to be possible. Tonight is our last night in this rental property. It has served us very well, and we will leave here with many fond memories. We plan to visit Universal again today but for now, the long and arduous task of packing needs to begin in earnest, lest we run out of time tomorrow and have to abandon our last day of theme park trekking as a result. Where to begin? This is what I kept telling myself as I surveyed the bombshell that is the way the house is currently best described. Everything is scattered evenly around the place. The carpet is barely visible under the clutter of toys and things. It wasn’t just the floor. In fact, every last surface has clutter on it. To be honest, it looks pretty much like our house in Australia would normally look. I guess that means we felt at home here. It all has to be packed up and put into the car somehow. I chipped away at it bit by bit, slowly manoeuvring things from where they were to a bag or suitcase somewhere. Every thirty seconds or so I had to stop and take a few deep breaths. The cold was taking its toll on my body. It made me feel extremely tired even after a relatively short burst of energy. When I wasn’t stopping to catch my breath, I was snivelling into a tissue. Between my runny nose, coughing and stopping for breathers every few seconds, the whole packing exercise was an uphill marathon for me. Sandy concentrated on the bedrooms. I spent most of my time sorting out the front room. One of the more important tasks was to ensure that Joey’s LEGO sets didn’t end up in a single pile of raw LEGO bricks. Eager to have him continue his enjoyment of them all after we fly out of Florida next week, I bought a box of large ziplock bags yesterday. The idea was to place each constructed set along with its corresponding booklet into individual ziplock bags. Unfortunately, some of them are too bulky to not break apart when compressed into a suitcase. Where it was possible, I kept the sets intact. That just wasn’t possible with most of them. The only option was to completely disassemble them. The idea was that Joey would be able to re-build them again at some future point. I did give Joey plenty of advanced warning about this. I mentioned it to him some days ago and reminded him of that again yesterday a couple of times. Even so, it was clearly a stressful thing for him to handle. That and the fact that it’s all change again. I was just about managing between the illness and Joey’s anxieties when I was hit with another unexpected stress. I have been e-mailing back and forth with the property owner over the course of the previous five weeks. We’ve maintained a very good open line of communication between us, which has really helped to ensure everything has gone smoothly, which it has done. This morning, however, I received a follow-up e-mail from him explaining that there has evidently been some sort of a mix-up. They had us down as vacating the property today instead of tomorrow. Apparently, the cleaners arrived this morning and left again after noticing the property hadn’t yet been vacated. We did hear voices this morning when we were still in bed, but we just assumed this was the neighbours chatting on their terrace. Ordinarily, this property is booked solid back-to-back during this time of year. As luck would have it, however, there’s a break between us vacating and the next occupants coming in. The property owner said that since we’ve been such good tenants, they aren’t going to make any fuss over the mix-up (it wasn’t clear whether the fault was ours or there’s and neither of us was bothered about that). Regardless of how the situation came about, the net result was that we didn’t need to pay anything extra and we would be allowed to vacate tomorrow after all. The owner did say there would be an extra resort fee for the additional day left to pay, but that’s outside of his control and I wasn’t really bothered about the $15, so no issue there. I would settle that up with the resort staff tomorrow morning when we check out. I guess it just goes to show there’s value in maintaining good relations as we have done with the property owner. By around noon, we had broken the back of the packing. All of Joey’s LEGO and other toys were packed neatly away. Most of the suitcases were full. There were still plenty of odds and ends lying around but chucking everything into bags to throw into the back of the car would be easy enough to do when the time comes. For now, we could at least leave the house and have some fun for the afternoon. Still coughing and spluttering, I managed to get myself into the car along with the others and we set off towards Universal via the 27. That would take us past the China Buffet, which was where Sandy and Jennifer wanted to have lunch. Neither Joey nor I were bowled over with that idea, so we dropped the girls off and doubled back to the Waffle House instead. Everyone was feeling a little more energised once fed. We were all back on the road again after I filled the car up with petrol at the filling station adjacent to the China Buffet. 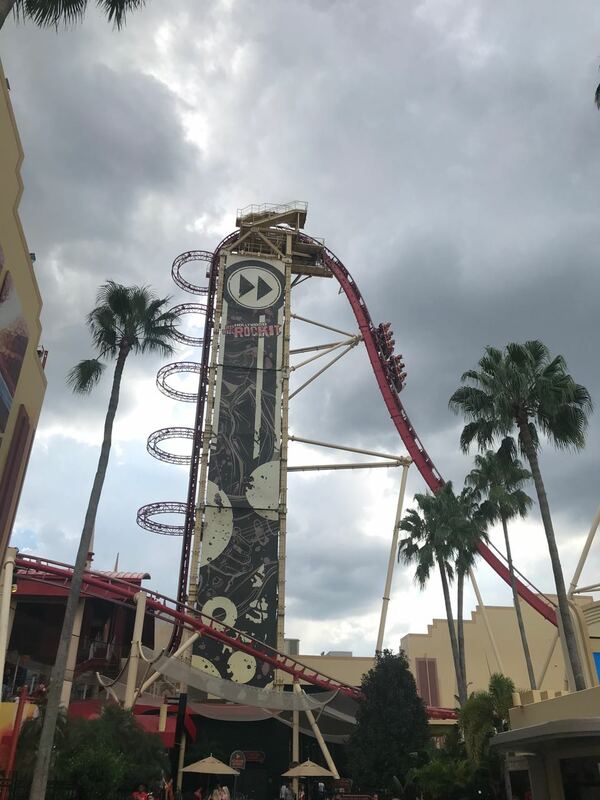 Once we paid for parking at the Universal car park, we struggled just a little bit with getting our car parked in our customary convenient fashion. The spots at the ends of the rows were supposedly all occupied already. Sandy pleaded our case and the attendant walked the length of the car park level to find something for us, which held us up for a bit. We weren’t complaining, of course. She eventually did find a suitable spot for us and beckoned us over. In the end, we were placed just about perfectly. That is to say, it minimised the distance we had to walk from the City Walk moving walkways to where the car was parked. Can’t really ask for more than that. We went in through the Universal Studios entrance today. Jennifer was keen to get one of the ‘It’s my birthday’ badges they hand out. Fortunately, one of the staff at the turnstiles had a box of them nearby. Both Joey and Jennifer were each given one with their names hand-written on them. At the time, I thought this was little more than a window-dressing gimmick. Still feeling ill, I was perhaps slightly annoyed, even, at the fact that this held up our progress for several minutes. I’m always keen to get moving into the park so we can enjoy ourselves, but we often tend to hang around near the main entrance each time for some reason or other. It could be that we need to visit Guest Services, stop for a photo opportunity, go into a store, or whatever else. It’s frustrating. It doesn’t help matters that it’s scorching either. Just standing still under the piercing sun can be quite annoying in and of itself. Nevertheless, the kids got a bit of a thrill out of being made to feel special. In fact, it turned out to be a good thing in the end anyway. Almost every member of staff that saw us today wished the kids a happy birthday. That really made them feel special. Sandy and Joey both made a beeline for the Despicable Me 3D ride near the front of the park. Jennifer and I were more interested in something a little more thrilling. We walked on a little farther to the Hollywood Rip Ride Rollercoaster. We came out of that looking for yet more thrills and found them on the Mummy ride. We did that one twice. Jennifer and I often like to strike an unusual pose specially for the camera on the rides. This time, we both struck a Zen meditation pose – not easy while being subjected to rollercoaster G-forces. At this point, the typical afternoon downpour commenced. The heavens opened up again, sending us scurrying for cover. The timing of this wasn’t good. We were already under some time pressure. The park would close today at 5pm and it was already after 4pm. The plan was to head over to Universal Islands of Adventure to continue our enjoyment after Universal Studios closed. 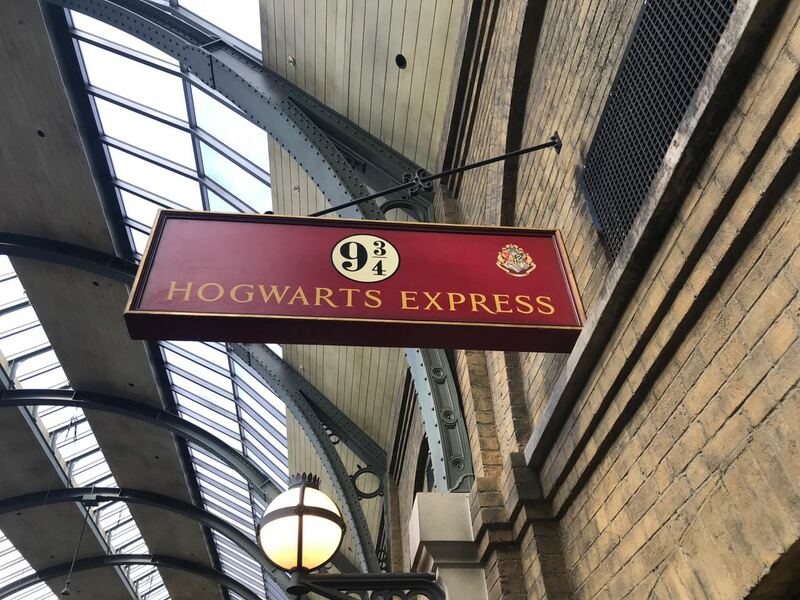 We could head to the park entrance and then walk all the way around to the other park entrance, or we could take the Hogwarts Express from King’s Cross to Hogsmeade. 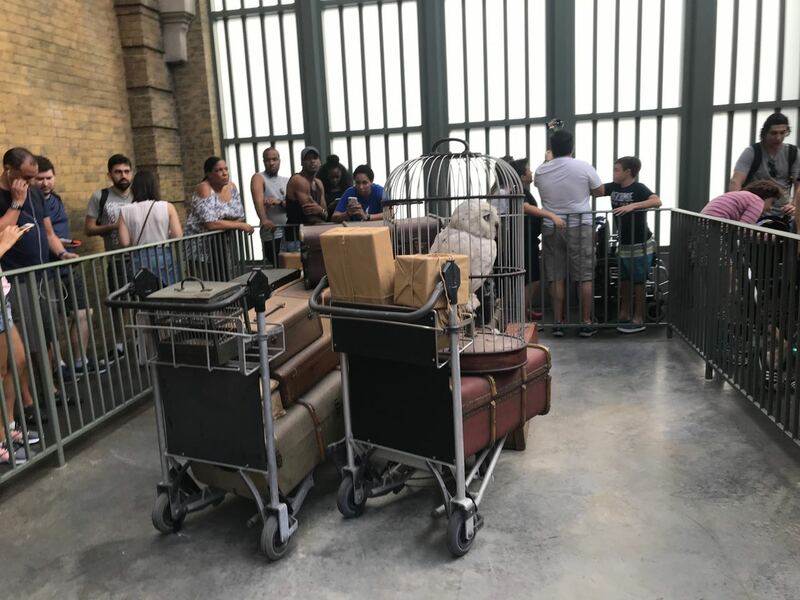 I asked a staff member about when the last train would go and was advised we needed to be there soon so as to ensure we got onto a train before the park closed at 5pm. Jennifer and I braved the weather and made our way over to Diagon Alley. 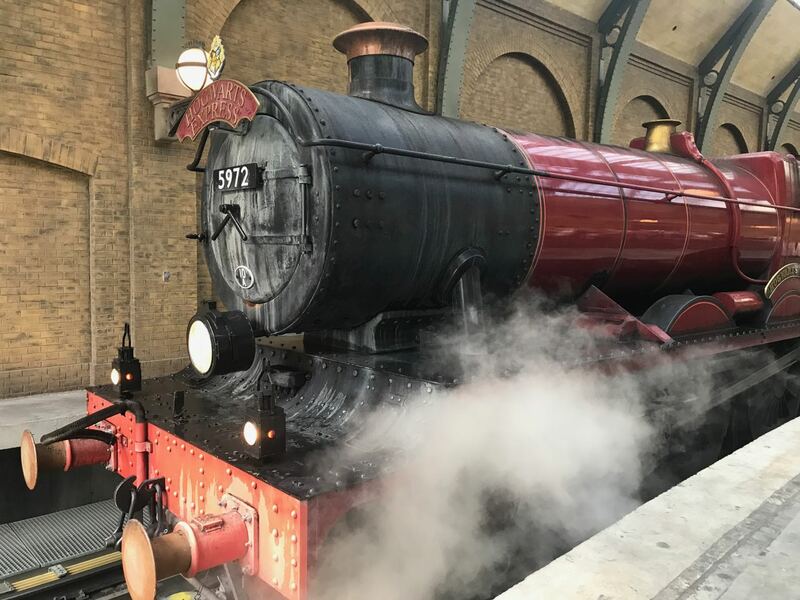 In fact, this wasted a bit of time since we needed to be in King’s Cross station, which is actually outside of Diagon Alley just next door. I called Sandy to advise her of the time restraint we were under if we stood a chance of getting over to the other park before the trains stop running. Naturally, this meant they would need to make haste and cut short their enjoyment of whatever it was they were up to. Of course, the frustration this levied upon Sandy was interpreted by her as something for which I should be blamed. Yes, I know, it’s my lot in life. Sandy and Joey eventually arrived at King’s Cross station to meet up with Jennifer and me. I took it on the chin the offloading of Sandy’s frustration at being flustered as result of having to get here on time. It was, after all, me that delivered the message of time restraint, therefore it was of course my fault. Joey was in a good mood. This surprised me until I noticed him playing with a new Transformers toy. I caught Sandy’s eye. She looked at me sheepishly and then ushered us quickly towards the awaiting ticket inspector. After our park-hopper tickets were examined, we were duly sent through the express lane, but there was still a lot more queueing on this side compared to what we experienced making this journey in the other direction the last time around. The express lane route certainly helped but there was still a good twenty minutes of queuing before we boarded the train. We bypassed some of it with the aid of an elevator. I think we would have struggled more had it not been for the fact that Joey was kept happy with his new toy. 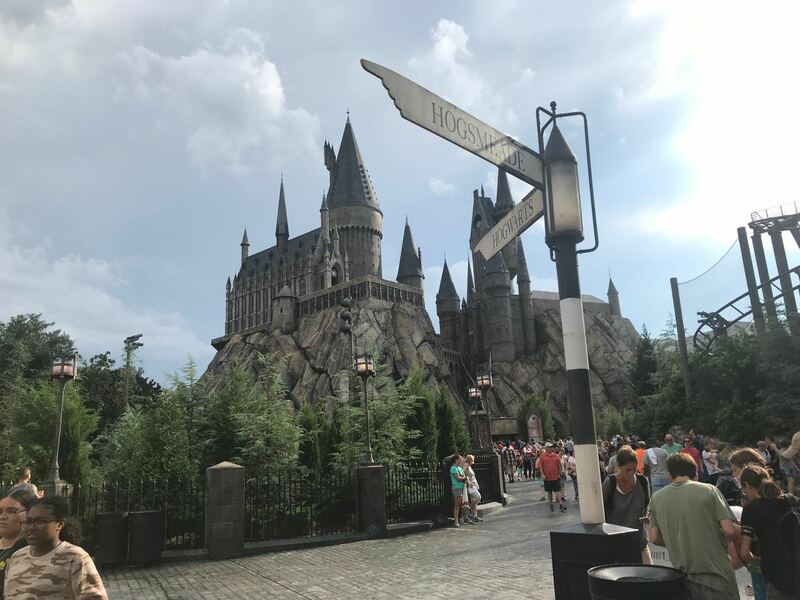 The trip across to Hogsmeade was every bit of fun as the journey in the other direction. It’s also a different series of events that you see ‘out the window’. Joey was a little uncomfortable with the fact we were in a carriage with several other strangers, but we struck up a fun conversation with them. That took the edge off a bit. 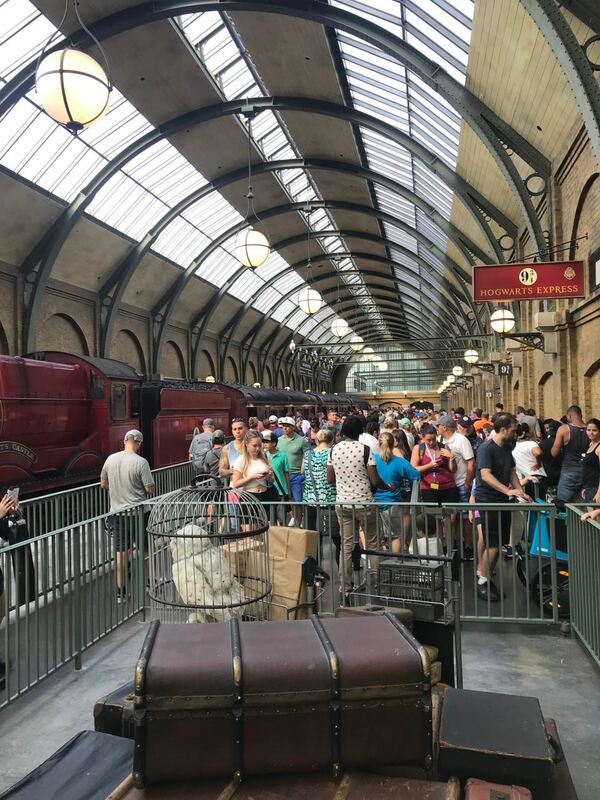 Within seconds of arriving and exiting the station, Jennifer had already latched on to the Butterbeer cart and I was ordering her favourite drink for her. Ridiculously expensive for what it is, but what can you do? Riding the coat-tails of Joey’s positive disposition still, he and I went in to the Harry Potter and the Forbidden Journey ride. Some of his good mood took a bit of a beating as we navigated the crowded and closed in locker area to offload our things for the ride. In fact, he was borderline non-functional as a result of the ordeal. We left the crowded Hogsmeade for the relative calm of the Jurassic Park section of the park. Sandy spotted an official photographer on the bridge and we lined up to be the next ones to take advantage of his services. A rather demanding Indian lady was directing the photographer in the meantime to take a billion different combinations of photos of her, her husband, her and her husband, her and her son, her husband and her daughter, the two kids together, the two kids over here, the two kids over there, etc. It seemed to go on forever. All of us – the photographer included – mustered all of our energies to stay calm and be patient with the woman until she was satisfied every last permutation was accounted for. At the end of it all, she apologised and smiled at me. I tried to feel guilty at not smiling back, unsuccessfully. Sandy and I agreed I’d take Jennifer and she would take Joey. They went off to spend a bit of time in the Jurassic Discovery center while Jennifer and I stopped to get some popcorn. The lovely old lady serving us noticed Jennifer’s birthday badge and duly upgraded us to a souvenir popcorn bucket for free. That’s another benefit we got from those birthday badges. Before the concessions stand lady was able to completely fill Jennifer’s bucket with popcorn, the heavens dumped on us again with a vengeance. We were trapped with only the barest of awnings from the concessions stand to keep us from getting a thorough drenching. We decided to make a break for it and to head for a larger building just around the corner. We made it there but in the thirty or so seconds it took us to traverse the short distance, we were both wet through and through. As luck would have it, we found Sandy and Joey in the Discovery Center. The upstairs section of this building is a restaurant, so we made ourselves comfortable at a table and chairs. Sandy even picked us all up some fries and drinks. We waited out the downpour for about half an hour. The skies quickly cleared, and everyone made their way back out into the park. Both kids stopped next at the carnival medley games to chance their luck (and my money) again. Jennifer won herself a medium-sized soft toy (Lord knows we don’t have enough of them already!). Joey continued his lucky streak, netting himself a large one. Both kids let off a bit of steam in the Camp Jurassic climbing playground-come-park for a bit. This time, they found the water guns. There’s a bank of them on high ground aiming down and a bank of them on low ground aiming up. The idea is that you drench your opponent before they get a chance to drench you. The net result today was that both kids drenched each other. And I do mean drenched. For all intents and purposes, they could have stood under a shower for a couple of minutes and not gotten quite as wet. They insisted on showing me where this water play area was, which of course resulted in me coming out quite wet as well. Since we were all wet anyway, the three of us walked over to the big water drop ride. The kids enjoyed it so much they decided to go around for another go – twice. Joey had been eyeing a replica dinosaur claw in the shop, which Sandy decided he could have. It would keep him on an even keel for a bit longer as well, which would be an added bonus. By now, we had sucked as much enjoyment out of the park as we thought we might, so we started the slow progress around to the front of the park. This being the last day at Universal, Sandy wasn’t keen to see it end until we had truly sucked all the marrow out of life, so we were in no rush to leave. Indeed, we got as far as Toon lagoon and the Dudley Doright Rip Saw Falls water drop ride where the kids both wanted to have a go. They enjoyed it so much, they went on it again, and again. Each time, they came out dripping. Each time, we had the attendant at the photo booth scan our photo pass to load the photos on to it. We did get some really neat photos in the end. With the park now close to closing, we had to call it a night and made our way back towards the car. Joey had reached and well exceeded his threshold. He lost it completely. He was upset, whimpering, suffering from anxiety and generally not a happy bunny. We needed to get him fed, dried up and into a familiar and comforting surrounding as quickly as possible. It was around 9pm by the time we got to the car and were back out onto the road, but we still needed to eat. We decided to have one last visit to the Golden Coral. It was a real challenge getting Joey out of the car. Fortunately, Sandy’s patience is practically limitless (or at least it was tonight), and she managed to get him inside after about ten minutes of trying. It took a while before he would eat anything, but he started to perk up not long after he did. By the end of the meal, the balloon was fully inflated again, and he was back to his usual self. Back at the house, we put the kids to bed and continued with the arduous task of packing. My cold had really knocked the wind out of me and I was in bed much sooner than Sandy, though.